Following our report that a Model X owner has filed a class action law suit against Tesla, claiming a widespread defect in the vehicle’s onboard software causes sudden unattended acceleration (SUA), new details behind the suit have been obtained by Teslarati that shows a legal team aggressively targeting the core component to the Silicon Valley-based electric car maker’s fleet of vehicles. The class action filed in federal district court claims Ji Chang Son – Korean star residing in Orange County, Calif. – crashed through his garage and into the living room of his home after his Tesla Model X accelerated suddenly and without warning on September 10, 2016, approximately one month after Mr. Son took delivery of the electric SUV. The suit claims that “Tesla has failed to properly disclose, explain, fix, or program safeguards to correct the underlying problem of unintended acceleration”, adding that “over sixteen thousand Model X owners with vehicles that could potentially accelerate out of control. Son’s attorneys gave the court a full account of the development of the Model X, focusing on the company’s claim that the Model X is “the safest, fastest and most capable sport utility vehicle in history.” On the contrary, according to Son’s attorneys. 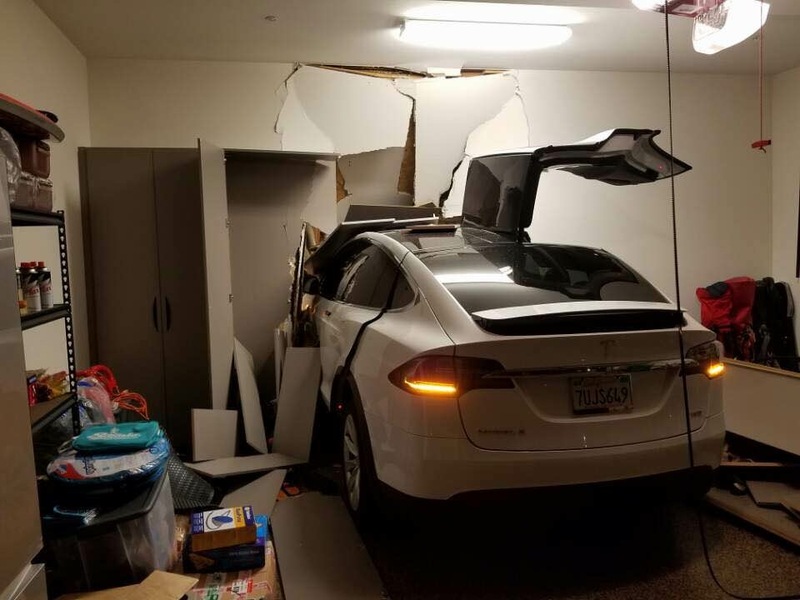 They allege the Model X has a safety defect that permits the car to accelerate at full speed directly into solid objects, such as the exterior wall of Son’s home. In particular, they point out that 8 written complaints have already been filed with the National Highway Transportation Safety Administration from other Model X owners who report similar occurrences while driving their cars. “Irrespective of whether the SUA events in the Model X are caused by mechanical issues with the accelerator pedal, an unknown failure in the electronic motor control system, a failure in other aspects of the electrical, mechanical, or computer systems, or some instances of pedal misapplication, the Model X is defective and unsafe. Tesla’s lack of response to this phenomenon is even more confounding when the vehicle is already equipped with the hardware necessary for the vehicle’s computer to be able to intercede to prevent unintended acceleration into fixed objects such as walls, fences, and buildings. Despite repeated instances of Model X drivers reporting uncommanded full power acceleration while parking, Tesla has failed to develop and implement computer algorithms that would eliminate the danger of full power acceleration into fixed objects.This failure to provide a programming fix is especially confounding for a vehicle that knows when it is located at the driver’s home and is being parked in the garage, yet carries out an instruction, regardless of whether through an error by the vehicle control systems or by driver pedal misapplication, to accelerate at full power into the garage wall. You turn the steering wheel sharply. You press the accelerator pedal. You press and release the brake pedal. Class action lawsuits are complex and highly specialized legal actions. Federal law requires that the damages alleged for the entire class exceed $5 million. The plaintiff’s attorney have done so by claiming that Tesla is aware of at least two other instances in which drivers allege sudden unintended acceleration occurred while driving their Model X at low speeds. They then extrapolate those numbers to suggest that the rate of SUA incidents attributable to the Model X is 64 per 100,000 vehicles — substantially higher than for any other vehicle in history. 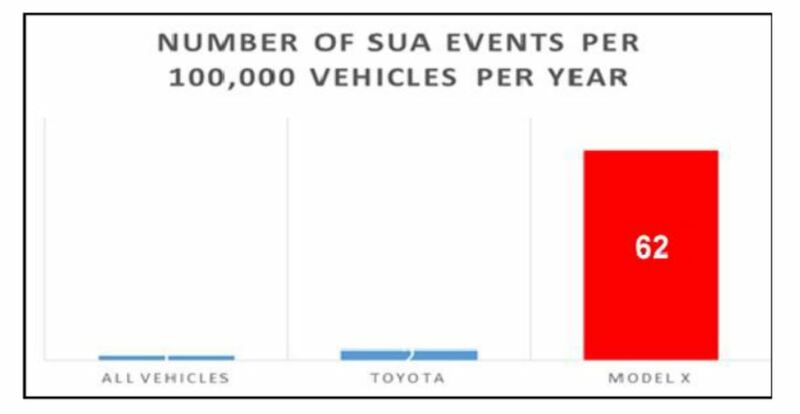 They point out that the incidence rate of SUA incidents for Toyota vehicles — which grabbed national headlines in 2010 — was far lower. They then go on to remind the court that Toyota paid several hundred million dollars to SUA victims as well as a $1.2 billion federal fine. Notice that the chart included in the pleadings shows an exaggerated and disproportionate projected SUA incidence rate for the Model X highlighted in bright red. Tesla says its data retrieved from the vehicle’s blackbox shows the accelerator in Son’s Model X was fully depressed when the accident occurred. The question for the court will be whether the driver pressed the wrong pedal or whether the vehicle accelerated on its own. It is unclear whether a software failure would register the pedal as fully depressed even if it was not physically operated by the driver. Plaintiffs always have the burden of proving their allegations. Attorneys for injured parties often rely on a legal doctrine known as res ipsa loquitur, which is Latin for “the thing speaks for itself.” Loosely translated, it means “we don’t know what is wrong with your product that you designed and built, but you know or should know.” Res ipsa loquitur shifts the burden of proof onto the defendant, which makes it much easier for a plaintiff to prevail in court. One advantage the plaintiff gains from filing suit is the ability to discover what information Tesla has that is not yet public. Does Tesla know something it isn’t telling its customers? We may find out as this litigation goes forward. We’ve provided a copy of the entire class action filing below.